There are many things that we treasure about summer, but being foodies, top of our list has to be cooking and dining al fresco. This pork belly recipe is a knockout summer dinner winner. You could of course roast it in the oven, but why not take it outdoors and pop it on your kettle braai? 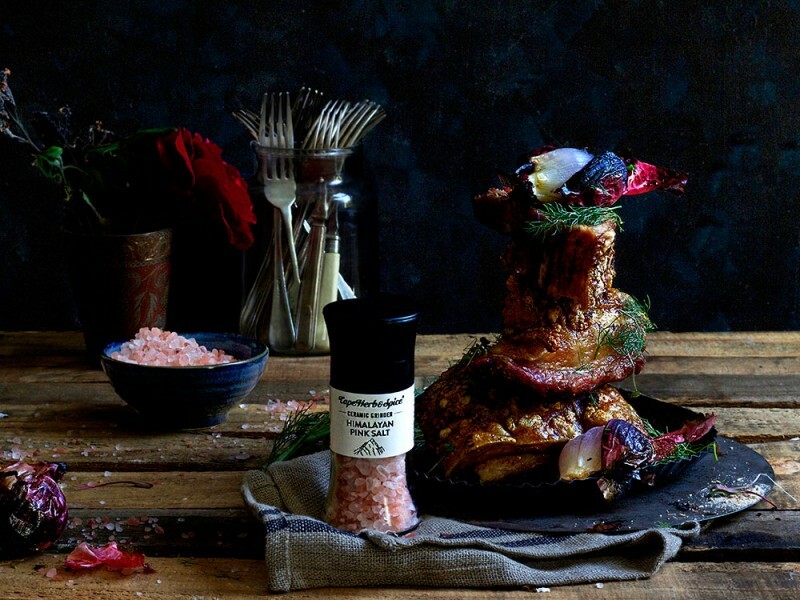 We used our Cape Herb & Spice Himalayan Pink Salt – now in a sturdy ceramic grinder – and married it with crushed dried fennel and a pop of of our Cape Herb & Spice Ghost Chilli Seasoning. A teeny drizzle of hot honey infused with rosemary right at the end and heaven it is! What more could you need? Well...braai-blistered baby red onions of course! We kept them in their skins and simply popped them in the kettle braai along with the pork belly. What emerges is a soft, smokey sweet onion delight. The meat should be succulently juicy in 60-80 minutes. The safest way to tell if it is done to perfection is to insert a meat thermometer into the thickest part of the meat after 60 minutes. If it’s 60 degrees Celsius inside, it’s ready for the next stage. Now turn the meat over so the skin side is facing down. Add the rosemary to the honey and blitz it in the microwave for 20 seconds until bubblingly hot, then paint the flesh of the pork with the rosemary honey. Leave it on the braai for another minute or two and remove. Allow the meat to rest for a good 10 minutes before you carve it. Pop the whole red onions onto the braai grid directly over the coals for the last 30 minutes of cooking to ensure that they are done at the same time as the belly. Serve with some of that Pink Salt, fennel and Ghost Chilli seasoning at the table so folks can add a pinch more salt if they want to.